A Slice of Homeschool Pie: What Do You Get When You Mix the Hit TV Show Shark Tank With Two Children's Imaginations? 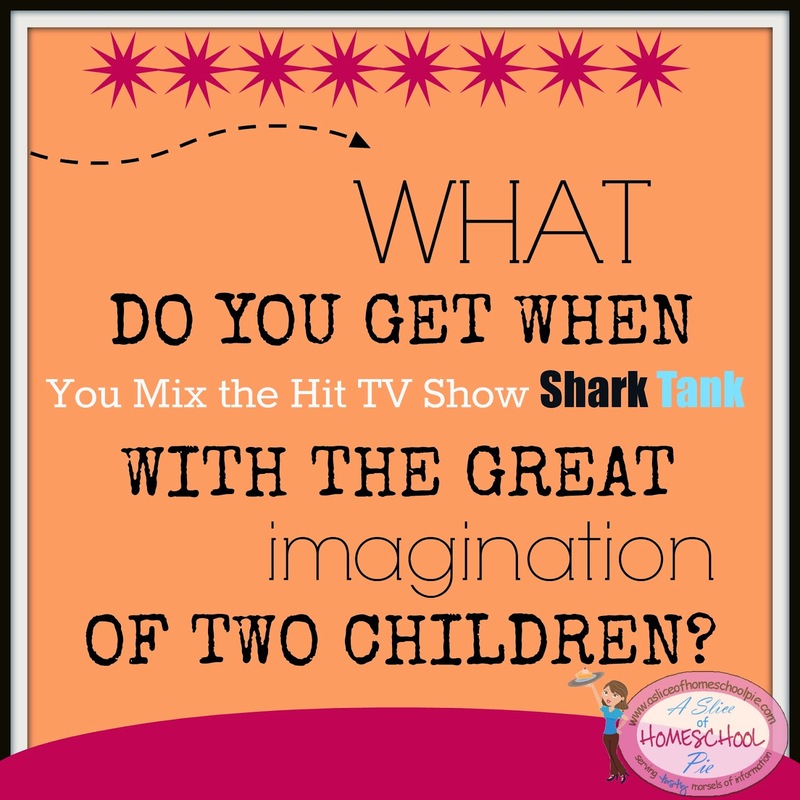 What Do You Get When You Mix the Hit TV Show Shark Tank With Two Children's Imaginations? My 7-yr-old: "Mom, I know of an invention I can make for Shark Tank." Me: "Oh yeah? What is it?" Him: "I can make a device that you could use to take the tag off a shirt and then when you're done with the shirt, you could use the device to put the tag back on." Me: "Hmmn. That is an idea." Him: "But I wonder if someone already has a patent on it?" Me: "Yes, I wonder that, too." Yesterday, his friend came over and using their imaginations they came up with their own special episode of Shark Tank. Are you a fan of Shark Tank? Do you have a favorite episode? Please share in the comment section below. My boys and I LOVE SharkTank! I just love this intro--so funny, can't keep smiling!! I had a lot of fun watching them come up with this all on their own. Love watching that show! I also watch the Canadian version: Dragon's Den. So many talented people! I saw the Canadian version but can't remember where I saw it. What station carries it? Love Shark Tank and I love that your boys are able to use it as inspiration for their own fun! What a great imagination! I love when kids take what they see and apply it to play. Plus his tag idea is GREAT! We watch Shark Tank all the time too. It's very motivational! Yes, especially when children are involved in the product! Me too! My oldest son and I bounce ideas off each other. I've seen a couple episodes of Shark Tank before, and it's really fun to watch. Not too long ago, I purchased this product and later learned that it came from Shark Tank. I love to see kids using their imaginations and creativity. I have not seen the show, though, so I will have to check it out. You can watch it online on ABC's website. LOL have these kids been talking to my husband? He thinks of new inventions all the time and then wants to bring them on there! That's so adorable. I love their version of Shark Tank. I do watch it and think some of the bickering is engineered, but it's a fun show. Shark Tank is one of our favorite shows. Love the imaginations! We love it because it's one of those shows that you can watch as a family. I won a young inventors prize for it and $250 for college, but I should have developed the idea further! I also have been pulling the stuffing out of dog toys for about 10 years. They're now called "stuffingless dog toys" and sold in ppet stores for like $10 a piece. Everyone laughed at me and I also regret not trying to sell empty dog toys before they hit the market! You can watch it on ABC's website. We watch the Canadian version, Dragon's Den, on CBC. I am obsessed with Shark Tank. I never knew about it until my mom turned me on to it. I don't know how much of it is simply put on for tv but they do give out great advice in some of the episodes. Kids are funny, lol! I've actually never seen Shark Tank, but I think it would be interesting to hear everyone's ideas. Once you watch it you'll be hooked! We've never watched Shark Tank, but now I'm thinking it might be fun! You can catch old episodes on abc's website. My youngest loves shark tank! He is constantly trying to dream up ideas so he can get on the show!